And that's why I'm bleary-eyed and sneezing. * It's lovely though. 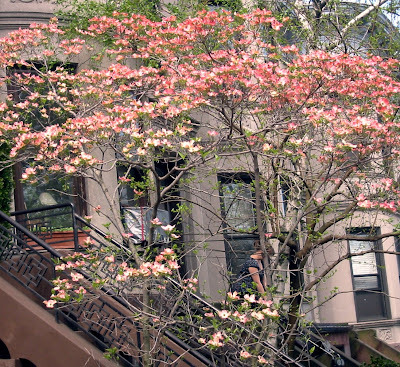 * Okay, I don't know if these are allergy inducing flowers, and I'm sorry if I'm defaming a flowering tree by suggesting that. If you must correct my claim that my itchy, watery eyes are caused by trees like this, please do so without using expletives and insulting my parentage. I realize that the comments of a blog are tempting places to bolster up one's ego, especially under the "anonymous" title, but it's a tad boring to read through foolishness when I have a finite amount of time before my daughter wakes up. Thanks! You are hilarious. Thank you. The Maples are the allergen culprits right now. You can see clouds of pollen shedding off them. Some early grasses are already maturing, as well. The warm weather compressed the normal Spring development so everything is happening at once. Hopefully we will get the promised rain tonight. Plant allergens come from wind-pollinated plants. The pollen is light enough to be carried on the wind, and onto and into us. Flowers pollinated by wind don't need to attract pollinators, so they are not showy flowers. They are almost always green, small, and non-descript. They put all their energy into producing gazillions of pollen grains. 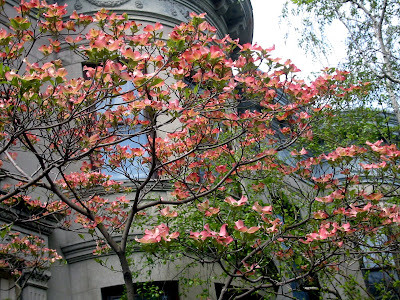 This tree is a red-flowering dogwood, Cornus florida. It is pollinated by flies, bees, and the like. It's not a source of allergies. Clearly, I stepped a bit too hard on that last exchange. I'm sorry about that. Anonymous: Not at all. I published your comment(s). You should see what comes in. Very unoriginal and tedious. You, at least, have something to say.